Audi officially introduced its Tesla-fighter, the 2019 Audi e-tron electric crossover, to the world this week. The car, decked in black and white camouflage paint, has been trundled around to multiple showing in recent months, so it was indeed a treat to see it in the flesh, so to speak. No sense boring you with all the adjectives. Suffice it to say it looks pretty much like a racy Audi crossover with a bit of Audi Allroad DNA (and stuffed with a pretty serious electric drive system), which isn’t at all a bad thing. It’s bigger than the Q5 but smaller than the Q7 and will compete with the Tesla Model X, Jaguar I-Pace, Mercedes-Benz EQC, BMW iNEXT and other premium electric crossovers. Audi slots it into its lineup between the Q7 and Q8. We didn’t get to drive it – no one did as far as we know – so there’s no impression yet of how it performs. Price: Including Audi’s $995 delivery and prep fee, the base model will start at $75,795; the Prestige trim starts at $82,795 and there’s a limited First Edition that goes out the door at $87,695. Powertrain: Audi handed out numbers for the European edition, but they supposedly will remain the same in the U.S. Total output is 401 horsepower in boost mode, with 414 pound-feet of torque. That boost mode is good for only brief bursts, however: in regular driving mode the dual electric motor system will provide a nice peak of 355 horsepower. Each axle gets its own electric motor and they are linked electronically for the first all-electric version of Audi’s Quattro all-wheel drive system, which apportions torque between the axles and among wheels as driving conditions dictate. Acceleration: That horsepower is good for a o-60 mph acceleration time of 6.4 seconds in normal mode, 5.5 seconds in boost mode. Battery Pack: It’s a biggie, 95 kiloWatt-hours, measuring 90 inches by 63.5 inches, and weighing 1,543 pounds. 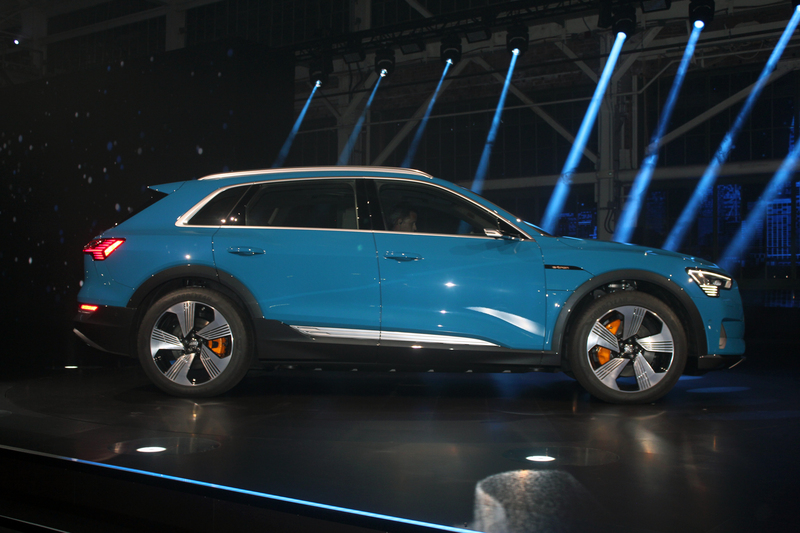 The 36 modules – a total of 432 lithium-ion cells – are packed into an aluminum safety cage that also serves to increase the e-tron’s rigidity and crashworthiness. It is installed below the floor and between the front and rear wheels. Audi devised a liquid cooling system that places the coolant underneath the cells to prevent liquid dribbling onto the lithium and igniting it if the cell walls are breached in an accident. Ordering: Audi is taking orders on-line. A fully refundable $1,000 deposit is required and one dealer told us that people who order now might have to wait a year or so to take delivery as Audi ramps up production at its plant in Brussels. The Audi e-tron is a global vehicle, and all models for every country will come out of the same plant. Dealers – in the U.S. at least – won’t be getting models to sit around in showrooms waiting for someone to come buy. Audi will only build an e-tron once the factory has an order in hand. Deliveries: Start in the second quarter of 2019. Future Models: A Sportback version of the Audi e-tron will launch later in 2019, with a sporty e-tron GT sedan and an e-tron compact coming in 2020. Audi has promised 10 fully electric models by 2025 – seven of them crossovers – as well as 10 plug-in hybrids.